Richard E. Grant Barely Survived Childhood. Now He's Thriving As An Actor The self-described "lifelong character actor" plays an alcoholic sidekick in the film Can You Ever Forgive Me? Through Grant is allergic to alcohol, he grew up in Swaziland with an alcoholic father. 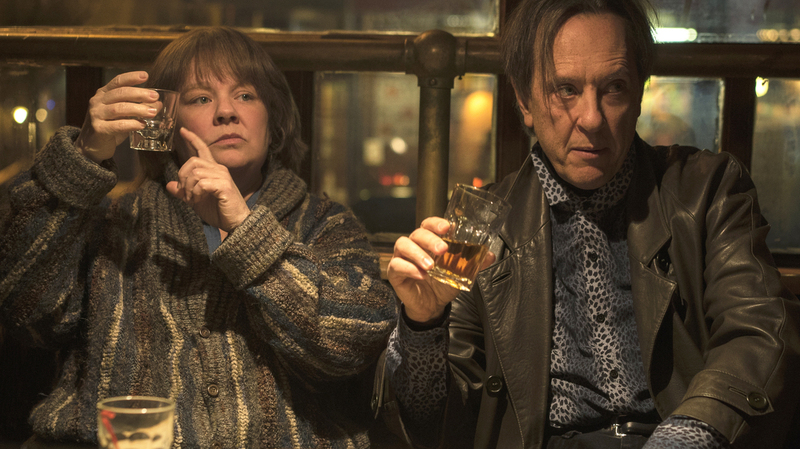 Richard E. Grant plays Jack Hock, the sidekick to literary forger Lee Israel (Melissa McCarthy) in Can You Ever Forgive Me? Growing up in Swaziland, Richard E. Grant was always fascinated by acting. As a kid, he made theaters out of shoeboxes and populated them with figurines that he'd cut from magazines. Eventually he moved on to real stages, first in school plays and then with an amateur theater club. But despite his persistent interest in acting, Grant says, "What wasn't clear is that anybody from [Swaziland] could possibly make a living and pursue this as a career seriously — that was what was deemed ludicrous." As it happens, Grant has achieved what once seemed impossible. The self-described "lifelong character actor" has appeared in countless TV shows and movies, including Withnail and I, Downton Abbey and Girls. Now he co-stars with Melissa McCarthy in Can You Ever Forgive Me?, which tells the story of a broke writer who makes money by forging literary letters. Grant plays an alcoholic in the film, which is ironic considering the actor himself is allergic to alcohol. Grant says he got into the role by drawing on memories of his own father, who was alcoholic: "My father was somebody who was very charming by day, and then literally Jekyll and Hyde, very violent, by night, when he was drunk." Though Grant has been nominated for a SAG Award and a Golden Globe for his performance in Can You Ever Forgive Me?, he tries not to have any unrealistic expectations for his next role. "Every time I try to plan something or assume that something's going to happen it never works out like that," he says. "It just means that the flurry that's going on at the moment is something that is like a roller-coaster ride and I'm enjoying and savoring every minute of it." Jack Hock has no violence at all in him. If anything, he is somebody that gets beaten up by people, as happens in the story. So what is autobiographical is that my observation as a kid and as a teenager was that the concentration that alcoholics have or drunks have when they're trying to cross a room and not fall over or bump into things or convince the world that they are sober — that concentration and focus is what I latched onto. Because of my father's job, he inculcated my brain from a very, very young age. He said, "Even though you're born here, you are essentially a guest in this country and you have to learn the local language in order to be able to justify why we're here." And he spoke absolutely fluently. And in 1963, when I began school, it was the first time that black Swati children were amongst white colonial children. So right from my first year at school it was "mixed-race," as it was called then. I wasn't aware in my childhood that there was a division. I went to a school called Waterford Kamhlaba, and "Kamhlaba" is what the king of Swaziland called the school, because ... in siSwati it means "all the world in one." When I was there, there were only 300 students, 27 nationalities and many political dissidents from South Africa had sent their children to be educated in the school, because it was multiracial and multi-denominational as well, so that was the basis of the school and has absolutely informed my whole life. Growing up in Swaziland, Richard E. Grant never imagined he could make a career as an actor. When I finally had a face-to-face with my mother about this 20 years ago, she broke down in front of me and said three magic words: She said, "Please forgive me." And the power of that was astonishing and remains so, and led to the complete rapprochement that I have with her. So now I speak to her on Skype once a week. I had been to see A Clockwork Orange, which had a ban; I was 14 years old and you had to be 21 years old at that time to go and see that X-rated movie. It was triple X-rated where I grew up. So I snuck out to see that with my best friend and had one of those Malcolm McDowell eyelashes I'd stuck down on my face and he was outraged that I had A) had gone to see this film, and then B) had come back wearing this thing. Because he was so drunk when he pulled the trigger, he missed, which is how I'm here today. Because he was drunk and [I was] trying to stop him drinking, I emptied a crate of Scotch whiskey down the sink, and didn't realize that he was still awake and he came at me with a revolver, chased me around the garden ... and found me, cornered me, and gun to my temple and [said], "I'm going to blow your brains out." And at that point I'd had such a gutful of living this sort of charmed life by day and then this alcoholism by night that I said, "Go ahead," as I do in [Wah-Wah], "Shoot me, get it over with." Because he was so drunk when he pulled the trigger, he missed, which is how I'm here today. I ran away and I stayed with a friend for a week and then my stepmother found out where I was and then I came back. Of course, like he always was, he either had blacked out or had no memory of what he'd done the night before, and would sign a check and push it across the breakfast table and be full of remorse and beg for forgiveness and all of that. I absolutely loved and adored him, because he was a very, very funny, sharp-witted man and very provocative in his conversations. He was very well-read and all of those things. So reconciling that with this person that he turned into — I think that it's a measure of how much a child loves a parent. That even though [I had] suffered those things, I always very, very clearly understood that who he became when he was drunk was not who he was. To me, that was the monster, and it wasn't my father who I loved. Those two things made such a profound impact on me that I thought that the nature of keeping it secret is almost inherently toxic. I thought that to liberate myself and anybody else that might have gone through anything like this kind of childhood trauma, it enables other people to go, "You're not alone." So in speaking about it, I've met many other people who've suffered far worse things than this. So my feeling is to be open-book about everything. I've felt like I've gained strength from that rather than felt the oppression of having to keep secrets. Heidi Saman and Thea Chaloner produced and edited this interview for broadcast. Bridget Bentz, Molly Seavy-Nesper and Patrick Jarenwattananon adapted it for the Web.